Ash Trash receptacles provide tools for the community to actively participate in keeping public spaces litter free, clean and attractive. The unique half-circle design allows convenient placement along building exteriors, sidewalks and other outdoor edges. 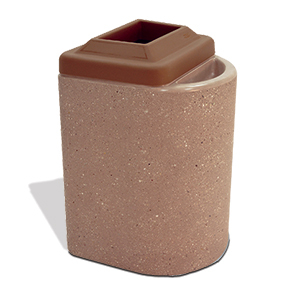 The receptacle comes standard with a 20 gallon square polyethylene liner and convex pitch-in top for hands-free trash disposal. Extinguish and dispose of smoking material in the sand filled snuffer. The body of the receptacle is constructed ASTM compliant, fire resistant reinforced concrete that will maintain its natural strength and beauty for many years. Available in a variety of standard and premium finishes to strike a balance with the landscape design.